Yes, you read that correctly! These plain looking cookies that are sweet and savory may not be for everyone, but all of our friends who are die-hard garlic lovers have found these cookies enjoyable as an after dinner treat. Mix butter and sugar until soft and well mixed. I used an electric mixer. Add the egg and then the white wine. Mix well. Sift the flour and mix with salt, baking powder, and baking soda. Mix with the rest of the dough. Stir in the coarse oatmeal (I did this by hand). Add the chopped almonds and garlic, both of which I stirred in by hand. Drop by rounded teaspoons on a cookie tray lined with parchment paper. These cookies do spread out a bit, so do not crowd them on the tray. Bake at 350 degrees F. about 12 minutes until just turning brown at the edges. Watch carefully as the time will vary depending on your oven and how large of a teaspoon ‘drop’ you use. Makes ~45 cookies using a well-rounded teaspoon for each. Next time I will make them smaller, for more of ‘tasting’. Really, these cookies are delicious (and yes, even I was skeptical). The best part is that one cookie is ‘just right’ for an after dinner sweet taste, without feeling like you must stop yourself from eating all of them. A local farmer friend who used to work on a garlic farm in Massachusetts told me that the garlic ice cream was always (always!) the first food item to sell out at her community’s annual garlic festival. So there you go – give these cookies a try. We’ll be handing out the recipe at our market table this year and may also even make some to sell at the markets, which we can now do under the guidance of the Michigan Cottage Food Law. 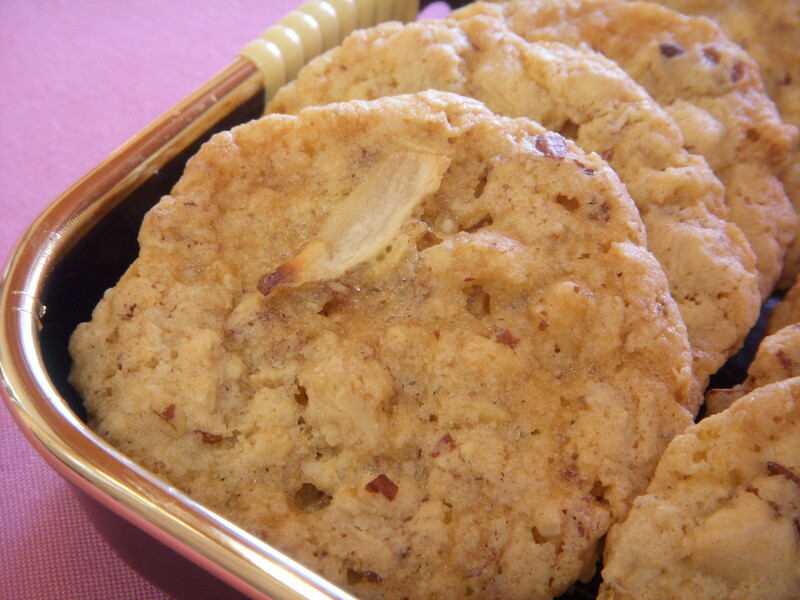 These cookies have tasted great with chai tea, hibiscus tea, and coffee. In addition, I’ll also bet they would be a dynamo taste pairing with an after-dinner porter beer. Enjoy something new, and I extend my thanks to one of our Garlic CSA members who found this recipe for us.